South Korean President Moon Jae-in on Friday expressed hope to form "true friendship" with Japan but said Japan must first look squarely at the countries' shared history. 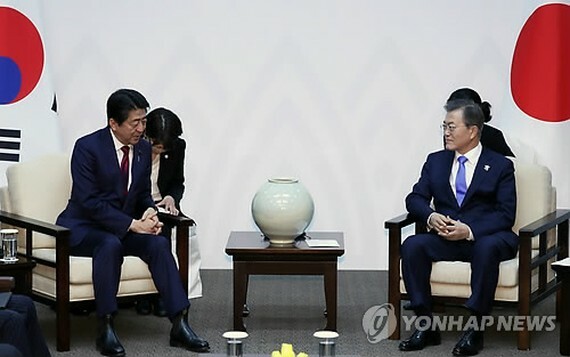 In a bilateral summit with Japanese Prime Minister Shinzo Abe, Moon called for efforts to enable a future-oriented relationship between the two countries. "I sincerely hope the two countries can be true friends that can communicate with heart. 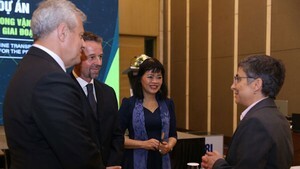 As I have repeatedly said before, I plan to work with the prime minister to enable future-oriented cooperation while looking squarely at history," Moon said, according to pool reports. The bilateral summit, the third of its kind since Moon took office in May last year, came hours before the two leaders were set to attend the opening of the 2018 Winter Olympic Games in PyeongChang, located 180 kilometers east of Seoul. The Moon-Abe summit was held in Yongpyeong, just east of PyeongChang. The South Korean president also expressed his willingness to resume what is commonly known as shuttle diplomacy, under which the leaders of South Korea and Japan paid frequent visits to each other for bilateral talks. Such visits have been suspended since late 2015 when the countries signed a controversial agreement to settle Japan's sexual slavery of Korean women during World War II. Seoul's former conservative administration under the ousted former President Park Geun-hye agreed to settle the issue "finally and irreversibly" in exchange for 10 billion Japanese yen (US$9.16 million). By Yonhap. Moon has said his administration cannot accept the agreement, though it will not seek its renegotiation. Abe earlier said he planned to urge Moon to faithfully implement the 2015 deal. "I wish to honestly share our views on a future-oriented and new relationship for Japan and South Korea while at the same time reaffirming the close cooperation between Japan and South Korea, and Japan, South Korea and the United States on the North Korean nuclear issue," Abe said at the start of his meeting with Moon, according to the pool reports. President Moon asked for Japan's support for inter-Korean dialogue, which resumed last month after a two-year hiatus to discuss North Korea's participation in the PyeongChang Olympic Games. "Our government is working to create an opportunity to resolve the North Korean nuclear issue and establish lasting peace on the Korean Peninsula through the PyeongChang Olympic Games and I appreciate the fact that the prime minister has actively supported the move with great interest," he said. "I offer my word of appreciation for your trip to South Korea, which has helped create a positive move to strengthen exchange between the two countries and their people. Our government too will actively cooperate for the success of the Tokyo Olympics to be held in two years time," Moon added.